Christmas is just around the corner and everywhere it's cold and beautiful. There are beautiful Christmas lights on the roads and Christmas starts in every window and the lovely red and white Christmas decorations in the whole market, and even in grocery shops. Basically it's Christmas and festivities in the air.. So how would the kids left behind? Apart from eating gingerbread cookies and amazing Christmas cakes, here's a lovely and easy Christmas Santa kids can make which can be hanged on your Christmas tree. Sounds lovely, isn't it? This is so easy I did it with 4-5 year old kids and it was lovely and beautiful for kids to have their own Santa! Begin by the kid tracing out his/her hand on the bottom of the paper with the pencil on the white paper. Rotate the paper and draw a line from the thumb across the hand as shown in the picture. Draw the eyes and the mouth. Cut little bits of the red paper and begin sticking them over the top portion as shown in the picture. This will become Santa's hat. Kids can stick small or big bits as they want. Now, as shown in the picture, begin applying the sticking gum over the fingers and take out small cotton balls to stick on the fingers to make Santa's white beard. Apply a little gum over the thumb tip as well and stick a little cotton (at the tip of Santa's hat). The kids can cut small squares (or any other shapes) and stick on the bottom of the Santa as presents from Santa. Done! Kids can add their own creativity and add sparkles, stars or decorations over the presents or on the sides. Punch holes on the top and hang on your Christmas tree with the help of a thread. 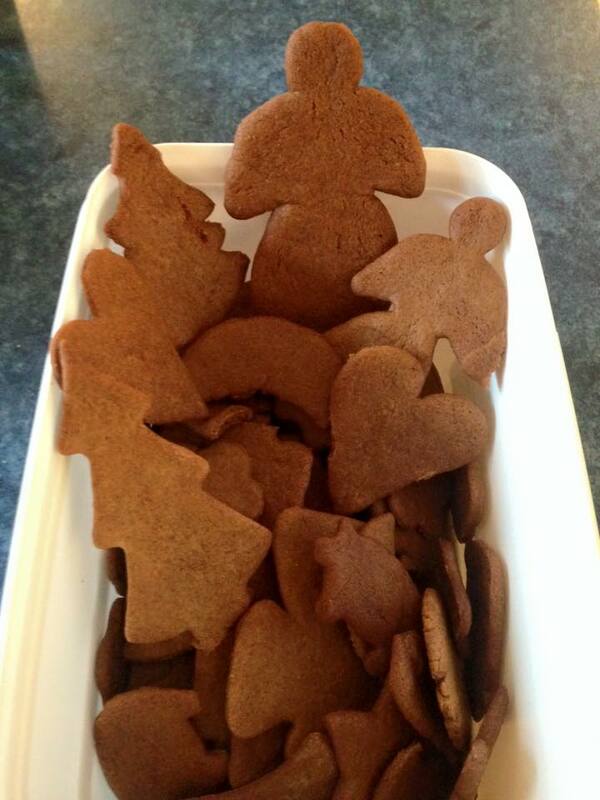 Here are the awesome gingerbread cookies we made with the kids. Ingredients: All purpose flour, unsalted butter, ground spices: ginger, cinnamon, green cardamom and cloves, molasses, dark brown sugar, baking powder, salt and warm water. Mix everything and make a firm dough. Cling wrap and refrigerate for an hour. Take out and make small balls in palms and roll with a rolling pin about 2-3 mm thick. Cut in desired shapes using cookie cutters. Line a baking paper in a baking tray and bake the cookies for 6 minutes at 200 C. The cookies will become slightly dark brown. Remove and store in air tight containers. Enjoy! Wishing everyone a great Christmas and a very Happy New Year 2016.